Sedgewick's photography shop on left. Off High Street, west side. Sedgwick's shop sold photographic equipment. 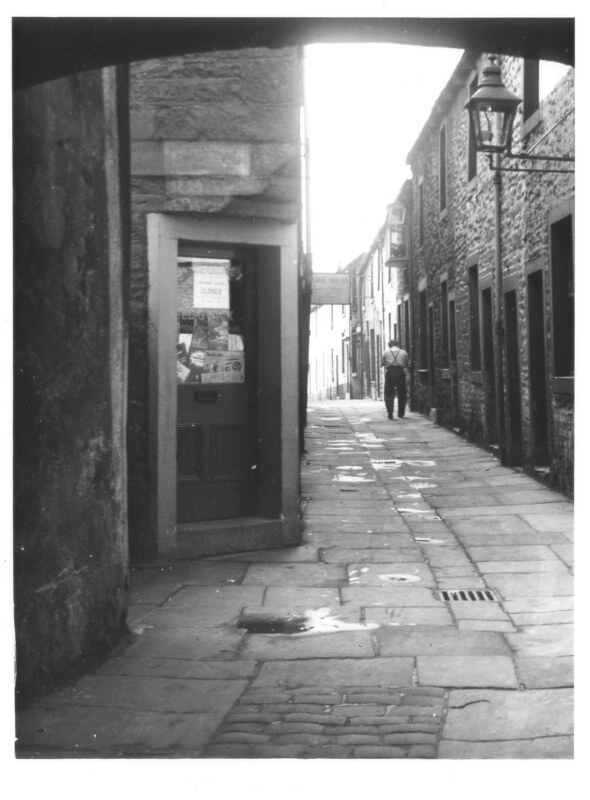 The sign to the left of the man was Elsmere Press Ltd, their doorway was set back and the sheltered space provided an ideal place for the older girls who lived on the street with us to read stories to the younger ones. My mother, who very recently passed away, was originally from Leeds, but moved to Skipton after she married my father, a Pole, who had been living in a camp near Skipton after WWII and who found work in a quarry just outside Skipton. I recently found an old sales receipt dated 1950, for the first camera they bought together, a source of immense pride to my father who had very little when growing up. The receipt is from this very same shop of Sedgwick. It is a great thrill for me to discover this photo and this collection and in a way retrace some of their steps. They loved Skipton more than any place they lived before or after. This is how I remember Albert and Victoria Streets - clean and tidy, not at all like some of these photos (576-588) which give the impression of a run-down slum. People actually scrubbed their front door step scrupulously clean often every day. It was a matter of personal pride as well probably a bit of being "better than the Jones".